TOKYO • The federation of senior citizens' clubs in Nonoichi, Ishikawa prefecture, launched a campaign two years ago called Stand Up 301, which encourages the elderly to get up at least once every 30 minutes, in cooperation with the city government. "We have been working on making the project well known at each senior citizens' club, and it has also begun to be practised at household level," said federation chairman Hiroshi Nishimura, 76. As people get older, they tend to sit for longer periods of time, and the duration spent watching television is an indicator of the length of sitting time. Concerns that excessive sitting can lead to "economy class syndrome", or deep vein thrombosis, and other negative health effects have been raised for a while now. In the head office of Rakuten in Tokyo's Setagaya Ward, each employee's desk can be altered to his or her preferred height. The office uses standing desks that can be adjusted up and down with electric motors, and while some employees sit in chairs and read documents, others stand up to work on their computers. 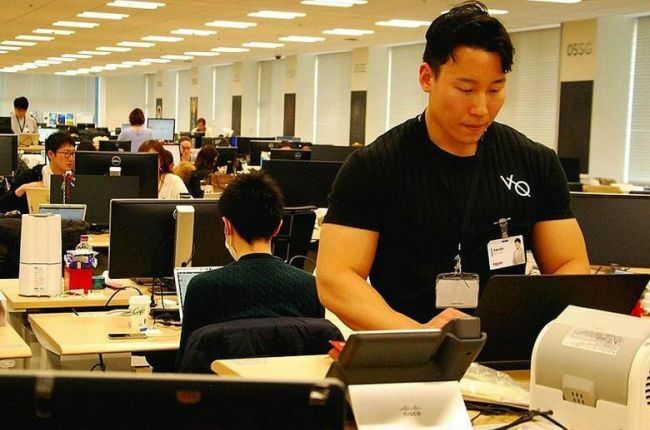 In 2015, the firm introduced about 13,000 standing desks for its entire workforce, including employees of its overseas offices, with expected benefits from improvements in both health and productivity.